Emmanuel Macron's first year: Could France's golden president lose his luster? France's youthful president may struggle to maintain the early momentum behind his painful reforms. One year on from his comprehensive election victory, Emmanuel Macron still enjoys an international reputation as France's golden boy. "He is perfect," cooed President Donald Trump as the pair met at the White House last month. 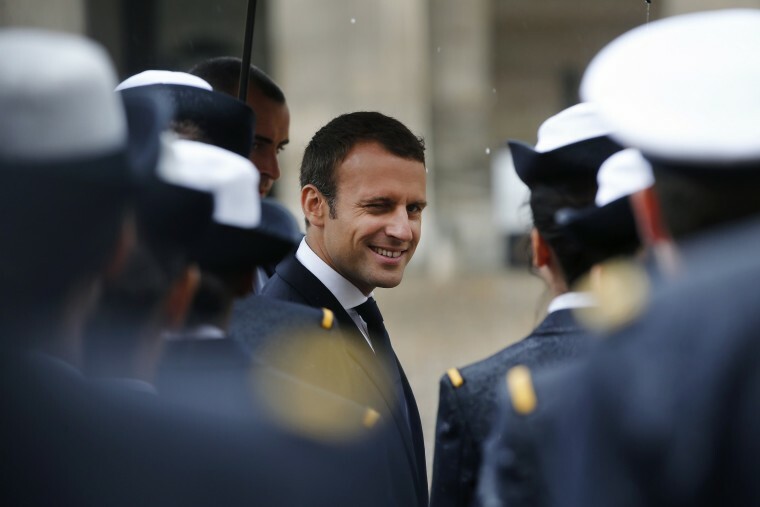 But at home, the youngest French leader since Napoleon is increasingly facing less favorable attention: "president of the rich,” “arrogant” and even “contemptuous" have been used to describe the man who will celebrate an eventful first year in office on Monday. And while Macron's approval ratings are higher than those of his predecessors — 44 percent in April, compared to 25 percent for Francois Hollande after his first year — they are following a now-traditional downward trajectory, having crashed from the high of 62 percent in May 2017. Is the 40-year-old at risk of sliding into the same malaise as Hollande, the socialist who served a single term before stepping aside amid brutal opinion polls? Not necessarily, according to analysts. “We cannot compare the situation,” Antonio Barroso at political advisory firm Teneo Intelligence told NBC News. “Macron is presiding over a year of economic expansion,” he said, while Hollande inherited a country still recovering from the global financial crisis. Macron swept to power — his first elected role after a career as an investment banker and economy minister — on a pledge to revolutionize French politics by ending the duopoly in which the same two political parties had dominated for decades. In his first month as president his new centrist party, La Republique En Marche, all but annihilated the opposition in parliamentary elections, securing a comfortable majority barely 12 months after it was founded. The boyish leader, who previously described the first year of a presidential mandate as “crucial," has been active in passing a number of reforms aimed at making France more competitive in the global economy. “He got rid of the wealth tax, weakened the conditions on layoffs and is now trying to amend rail workers' special status. Those are subjects many governments would have avoided,” Jerome Fourquet, a director at polling firm Ifop, told NBC news. “Some of these measures are unpopular. Sixty percent of French people were against the abolition of the wealth tax or against the labor law reform,” Fourquet added. What seems remarkable to commentators is the speed with which Macron enacted his pledges in a country often written off as beyond reform. Hollande, who in 2014 gave Macron his first government role as economy minister, had already tried to reform the labor market but public anger and huge protests resulted in watered-down measures and the splintering of his once-dominant Socialist Party. So far, Macron has largely retained public support for his proposals to open the state-owned French railway to competition and tackle its $64 billion debt. Since early April, railway workers have been on strike for two days a week in protest at plans to strip them of privileges such as jobs for life, early retirement and free rail travel. Opposition to Macron's plans to allow universities to be more selective in their admission process has also been lukewarm by French standards. Students have occupied a few universities, but previous reforms were met with much larger demonstrations. Going forward, however, things might not be as easy for Macron as some of his lawmakers begin to break ranks. An immigration reform bill passed last month caused division within his fledgling movement, with some denouncing it as too lax and others as too tough. The president has also drawn criticism from across the aisle for his bid to expedite legislation by limiting the number of amendments parliamentarians can make, thus further weakening opposition. His reduction of France's wealth tax led to Macron being labeled “president of the rich," an aide’s comment last year that Macron would not take part in a traditional Bastille Day televised interview because his “thoughts are too complex” for journalists earned him the “arrogant” tag, while his description of those who oppose his labor reforms as “lazy” and “people who are nothing” saw Macron portrayed as “contemptuous” by some on the left. And while he may have been a hit stateside, Macron was met by tens of thousands of protesters in Paris this weekend who danced, picnicked and railed against him at a "party" marking his first year in office. “Nowadays, dissatisfaction [with Macron] is strongest within the working and middle classes because they believe his policies do not benefit them,” Ifop’s Fourquet said. A poll released earlier this month by Odexa found that 58 percent of French people have a negative opinion of Macron’s economic and fiscal policies, while 80 percent feel the reforms mostly benefit bosses. This growing disconnect with the middle class could hurt Macron, Barroso said, as he prepares to tackle France's opaque pension system and its popular state-funded healthcare. “His strategy is to do as much as he can during the first two and a half years to allow time to prepare for reelection and to show the fruit of these efforts," Barosso saod. “But the negative ‘president of the rich’ moniker is one that he’ll have to fight."